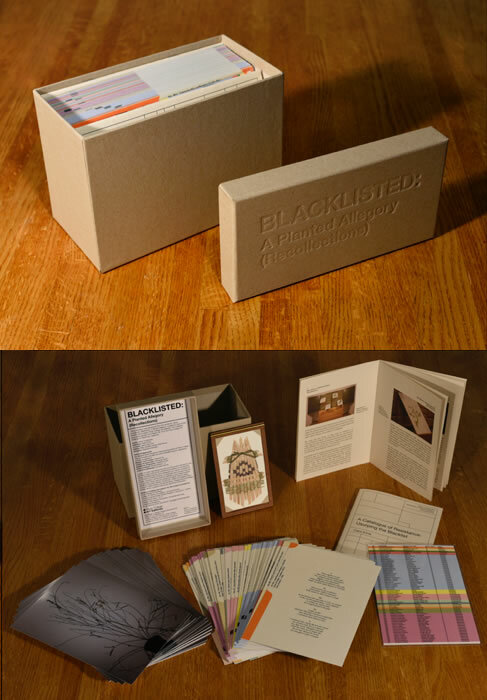 Blacklisted: A Planted Allegory (Recollections) is an artist edition, which contains distinctly textured components. It is a box that contains original images, short poetic narratives, a plastic-coated index sheet, an introductory essay by Glenn Harcourt, and an interview with the Jenny Yurshansky and Ciara Ennis. It is a record of the 133 invasive plant species that make up this project’s collection and is the final result of four years of research. This publication was developed as the last component tied to the exhibition, Jenny Yurshansky: Blacklisted: A Planted Allegory, curated by Ciara Ennis, Director and Curator, Pitzer College Art Galleries, it took place January 24 to March 26, 2015. This catalogue was printed in an edition of 200 copies, with special edition of 15 with blacklisted plant (Placeholder), is available through Jenny Yurshansky at PayPal or Venmo. Last modified by cheukwaj, on January 26, 2018.